City-living during the summer is hot to say the least. While the summer is slowly coming to a close, the sun in all of its heat is not going anywhere just yet. No summer is complete without at least one relaxing day of poolside laying out. We put together a list of a few pools open to the public, that way you can tick-off "dip in the pool" from your summer checklist. The Clubs at Charles River Park is a full-service health and fitness center that has been around for nearly 50 years. Boasting both heated indoor and outdoor pools, a wading pool, a huge sun deck and 80 newly renovated cabanas; if you're looking for a place to cool of or just lie out and soak up the sun this is the place to go. Open to the public all summer long, their "drop-in" rate is $40 per adult and $20 per child. Just want to take a quick afterwork swim? Stop by after 4p.m and they lower the fee to $10. 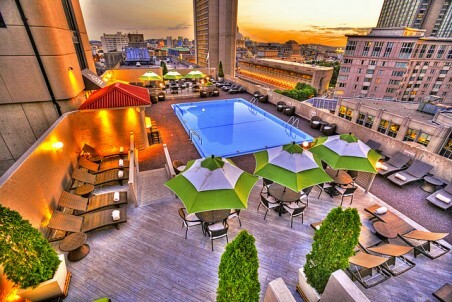 Open to the public Monday through Friday starting the day after Memorial Day until October, The Colonnade Hotel is home to the only rooftop pool open to the public in Boston. A full day at the 11th-story Miamiesque hangout will cost you $50 but come after 3 pm and the fee is cut in half. If you get hungry don't worry about having to change out of your bathing suit as food is available to order from the hotel's on-site snack bar. 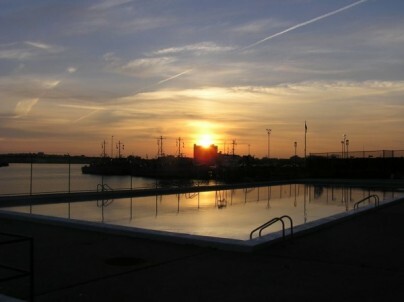 Located on the edge of the Boston Harbor in the North End, the newly renovated Mirabella Pool, run by the Boston Community Center, is the best deal around town for pool memberships. For just $15 a year, guests can soak up the sun while overlooking the Harbor.